133-Piece Deluxe Artist Painting Set. A unique assortment for a creative imagination! Art Supply's most complete artist paint set. An excellent assortment of acrylic, oil, and watercolor paint colors, canvases, and two portable easels without costing a lot in the process. This unique assortment of true quality named brand art products will provide an excellent way to begin motivational and inspirational art anywhere. Fostering creativity is one of the greatest gifts anyone can give someone special. This USA canvas painting set is a perfect gift whether you are looking for art supplies to help a child express themselves, want to help someone get started painting on canvas, or just need some items for yourself, this art set will be the perfect option. The Complete Artist Paint Set contains. One (1) PISMO Aluminum Easel. One (1) Solana Desk Easel. Two (2) Framed Canvases: 11 x 14. Six (6) Canvas Panels: 8 x 10. Art Supply (24) Color Acrylic Set. Art Supply (24) Color Oil Set. Art Supply (24) Color Watercolor Set. One (1) Small 4 Color Mixing Wheel. One (1) 11 x 14 Watercolor Paint Pad. One (1) White 10-well plastic color mixing palette. One (1) 5.5 x 8.5 Spiral Binding Sketch Pad. One (1) 9 x 12 Watercolor Paint Pad. One (1) 9 x 12 Oil Paint Pad. One (1) 9 x 12 Acrylic Paint Pad. The Solana Desk Easel by U. Art Supply is a portable tabletop storage box that can easily convert into a painting easel with one easy adjustment. The easel can easily incline into four adjustable positions and will accommodate canvases up to 11" x 14". It features a drawer with three compartments that can be used to hold brushes, paints, and other essential artist gear. The drawer latches securely for easy storage and travel. A clever, light-weight design that enables any artist on-the-go to paint anywhere. Sturdy, portable and fully assembled. Art Supply PISMO Aluminum Easel is a portable, lightweight field easel that's great for painting at a moment's notice. Along with a convenient carrying bag with shoulder strap, paint freely anywhere, anytime. The easel features adjustable legs that allow for indoor, outdoor and tabletop use. The spring loaded top clamp secures canvases in place. It has easy adjustable turn knobs for quick height & angle adjustments. It will accommodate canvases up to 32 in height. It folds to 22 for quick storage and portability. The 11" x 14" quality artist canvases are made from natural, unbleached medium-weight cotton duck and is stretched around 3/4 profile kiln-dried stretcher bars and held in place with a flexible spline allowing these canvases to be painted on all four edges as well as the canvas surface. The canvases are triple primed with acid-free acrylic titanium gesso and suitable for oil and acrylic painting. You can hang your creation with or without the frame. Art Supply 8" x 10" Professional Quality Canvas Panel is an economical and easily portable alternative to a stretched framed canvas and great for students and artists on the go. Designed for use with all media. The canvas wraps around all sides and is secured in place on the backside. Art Supply Watercolor Paints are high quality translucent colors with a creamy, soft consistency. With good working properties, tinting strength and light fastness, achieve a brilliant spectrum of light and texture effects. Ideal for flat, graded, and blended washes. Perfect for collages and an excellent medium for painting natural scenery, landscapes and seascapes. Set contains 24 watercolor paint colors in 12ml tubes: Chinese White, Lemon Yellow, Yellow Ochre, Gamboge, Cadmium Yellow, Orange Yellow, Vermilion, Brilliant Red, Crimson Red, Magenta, Scarlet, Green Light, Lamp Black, Burnt Umber, Raw Umber, Burnt Sienna, Violet, Prussian Blue, Ultramarine Blue, Cobalt Blue, Cerulean Blue, Permanent Green, Deep Green, Sap Green. Art Supply Acrylic Paints are high quality pigments that deliver a stunning color brilliance with a smooth consistency and satin finish. Contains excellent pigment load, good covering strength, and blend easily. Can be used in high gloss or matte finishes and impasto effects. For use on a variety of surfaces such as wood, canvas, fabric, and more. Set contains 24 acrylic paint colors in 12ml tubes: Titanium White, Flesh, Lemon Yellow, Yellow Ochre, Cadmium Yellow, Yellow Mid, Orange Yellow, Vermilion, Crimson Red, Scarlet, Green Light, Emerald Green, Lamp Black, Van Dyke Brown, Burnt Umber, Burnt Sienna, Raw Sienna, Purple, Cobalt Blue, Ultramarine Blue, Phthalo Blue, Cerulean Blue, Viridian, Sap Green. Art Supply Oil Paints are remarkably versatile. They contain an excellent pigment load with lightfast results. Ideal for glazing and blending, they offer a smooth, buttery consistency with an excellent color richness giving artist a "True" long lasting color. Oil paints are slow drying which allows artist to easily modify paintings while developing to achieve the best effect. Set contains 24 oil paint colors in 12ml tubes: Titanium White, Lamp Black, Zinc Titanium, Payne's Grey, Flesh, Raw Umber, Lemon Yellow, Burnt Umber, Yellow Ochre, Raw Sienna, Orange Yellow, Burnt Sienna, Vermilion, Violet, Scarlet, Prussian Blue, Ultramarine Blue, Rose, Cerulean Blue, Crimson Red, Phthalo Blue, Emerald Green, Cobalt Blue, Viridian. This set also includes a color mixing wheel and a 10-well color mixing palette. The Color Mixing Wheel is a must have and easy-to-use tool for artist and painters of all ages. It features primary, secondary and tertiary color mixtures, tints, tones and shades, complimentary, warm and cool colors, gray scale, and our Color Terminology and definitions. Art Supply Nylon Hair paint brush provides smooth strokes, retains stiffness, durability, and when used with acrylics and other water based media, cleans easily with soap and water. Seven (7) brushes included: #2 Round, #4 Round, #2/0 Liner, #2 Shader, #6 Shader, 1/4" Angle, and 3/4" Wash. Art Supply multi-purpose paint brush set provides all the essential brushes needed for acrylic, oil, watercolor and gouache paint mediums. They provide smooth strokes, lasting durability, and cleans easily with soap and water. (15) brushes included: (11) short handle - #1, #2, #3, #4 & #5 Pony Round, #1, #3 & #5 Bristle Round, 1/2" Bristle Flat, 1/4" & 1/2 Pony Flat. (4) long handle - #2 Pony Round, #4 Pony Flat, #4 and #8 Bristle Flat. Art Supply Bristle Hair paint brush are ideal for oil painting and provides smooth strokes, lasting durability, and cleans easily with soap and water. (10) brushes included: #1, #2, #5, #6, #7, #8, #9, #10, #11, #12. Brush Bundle Studio Pack With Holder A handy value pack containing a total of 18 good quality white nylon, short handle brushes. One each of round and flat in sizes 1, 2, 3, 4, 5, 6, 7, 8 and 10. Includes a free brush holder that features eleven double pockets and a fold-over flap. The brush holder can hold up to 22 short handle brushes. This listing is currently undergoing maintenance, we apologise for any inconvenience caused. The item "US Art Supply 133-Piece Deluxe Artist Painting Set with Aluminum & Wood Easel" is in sale since Wednesday, June 17, 2015. This item is in the category "Crafts\Art Supplies\Painting\Acrylic Paint". 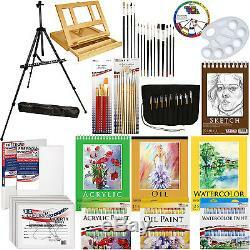 The seller is "usartsupply" and is located in San Diego, California.